We then get onto Galileo. At times, Rovelli's history of science goes wildly astray - he says, for example, that Galileo was the first experimenter - what of William Gilbert or the medieval optical experiments, for example? Similarly, Rovelli tells us that no one from Newton to Faraday tried to come up with an explanation for action at a distance - which just isn't true. Not only did Newton himself have an idea, there were plenty of mechanisms proposed. This isn't a matter of obscure history, you can read about it in Wikipedia. Best then to move on from mangled recounting of the past and get on to the more recent physics. Here, in a gallop through special and general relativity and quantum theory we get far more rigour, though oddly it often comes in ways that aren't always obvious - for example we jump into to general relativity with the idea that spacetime is a field, without any of Einstein's far more accessible route using the equivalence principle. It fits better with the model that Rovelli is using, but it doesn't help the reader understand what he is talking about. The last part of the book takes in what has been its goal all along - loop quantum gravity. 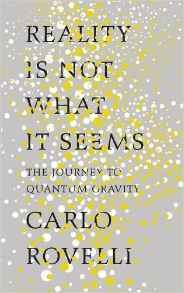 In his opening, Rovelli remarks that a book (for the public) on loop quantum gravity didn't exist which is why he had to write it. This isn't true, there was Martin Bojowald's Once Before Time - but that failed singularly to explain the theory in a comprehensible way. This is where I hoped I could finally get the point of Rovelli's writing. I desperately want to see a good, accessible introduction to loop quantum gravity.The good news is that Rovelli on the topic reads a lot more smoothly than anything I've so far read - but he still fails to bring the topic to a level the general reader can get his or her head around. The book should have had an editor brave enough to keep sending it back until Rovelli had got there, but it clearly didn't happen. You may gather I had problems with this book, but I have to congratulate Rovelli for trying. What was most frustrating was that if loop quantum gravity were as obvious to physicists and as complete as it's presented, it would be quantum gravity solved and no one would be bothering about string theory (which Rovelli only gives a passing mention to). Tick. Next problem? We know it's not really like that. Also, like many physicists seem to do, Rovelli either doesn't realise a model isn't the same as reality, or forgets to explain this to his readers. Even so, it is an interesting book despite its problems.